While going on at full speed with new "traditional" releases (P-47, Bf.109K, Dauntless, D4Y in July; 1 1/2 Strutter, Phoenix D.I, Nieuport 11, Albatros C.III in these days; new game mats around; Battle of Britain starter set pretty soon), and while a new reprint of Rules Packs and Duel Packs are hitting the shelves, a quite unusual "old style Sci-Fi" set is announced. Last edited by Angiolillo; 09-13-2016 at 02:35. Looks interesting and possibly a way to get new players into Wings of Glory. It would be really nice if the plane in the T&T started was either a unique type or at least paint job so that current Wings players could pick up that starter to both try the game and add to their Wings collection. That will need extensive playtesting for balance. I better start saving for the tripods.. Yes, Pesce d'Aprile - 1st of April. This is real. Or... It will be. Love it. Need to start saving now.......! Oh boy... we'll soon need a Tripod emoticon! It is a common photo tripod (smartphone probably) with cut off upper mount (3 Euro value) . A well spent 3 coins! Interesting what if expansion . I use paper silouhettes from the actual artwork. At the link in the first post, English text and renderings of one of the future miniatures.. I said this on Facebook and I will say it here... I would be so majorly stoked if we could pull off away to run a demo or two of this at next year's Origins Game Fair!! Oh, I don't doubt that it is an actual planned project. Sorry for the confusion...my humor can be, even for native English speakers, difficult to understand if you're not in my mind. And believe me, most of the time, that's not where you want to me. As for the game itself, hm, I think I'll have to pass. Too many other S/F projects on my plate. That's where I first encountered War of the Worlds. Oh NO! Dr Who game this fall and now the War of the Worlds! When will it all end . . . . Oooo, now I can do my Northrop flying wing bombers! Yea! I have the boxed set of that one, Mike. I can still hear Richard Burton telling this story. I was having flashbacks of this album when watching the Tom Cruise (2005) remake. From BottosCon's Facebook page, for those with a log-in. Thanks to everybody for the great pictures. Can we equip the planes with bacterial warfare sprays or bombs? The ideal weapon would be massed Kettering Bugs carrying blister agents or biologicals, or even infra-red absorbent smoke. Just remember - the Martians would have 20 years of tech development between 1897 and 1917 too. Agreed, I'm not that into sci-fi but I'd likely buy in if there were new planes or paint schemes available that way. I hope some triplanes appear in the game since I didn't see any in the photographs. There is a game called All Quiet on the Martian Front (AQMF). The company went bust due to promises not fulfilled. There is a forum for this. I have a book based on the game and it was a good read. don't get me started!!!!! where is my "Thing Maker?" I had a copy of this back in the day, I think my mother took it to the book exchange after I moved out. I remember one page with an excellent drawing of a dreadnought under attack. I read the comic SOOO many times. Nice copy of the Classics. I have the War of the Worlds on album and CD. Good music that follows the story. I have a 1/72 Tiger tank that I named ULLA after listening to the album. Somewhere I have a paperback of War of the Worlds that I read in my youth. I'm ready to defeat some Martians!! Here are some photos I took at Historicon this year of a AQMF game. The producers of AQMF may have gone under, but obviously someone(s) snatched up a bunch of product. I can't wait for this version of Wings of Glory to come out. This may be the big gateway draw for new enthusiasts to the game at upcoming conventions. Whether I like it or not, Snoopy was the draw that got people to my table at MosaiCon on Saturday, and the game brought them back for the HMS Glorious on Sunday. I am trying to develop an Air Race version, as another gateway to the core game. Cool stuff! A little spendy though, the elves are not happy with the prospects of being invaded . . . This is cool. I'm sure many of us wanted something like this! It's a good opportunity to write up some proper coop rules, for battling AI led aliens, would be huge. And it's a good opportunity to have a neat campaign structure developed. And it's a good opportunity to manage resources, deployments and so on. That is to say, point balanced outings and selections of weapons, heat suits, armour, or whatever. There need to be some missions for the Giants too! Just an observation about the possibilities of this idea. As mentioned above in post #22, a parallel thought process occurred in Vancouver, and one of the Wings of Glory game hosts at BottosCon 2016 is putting on a scenario with tripods. To the best of my knowledge, this scenario was conceived and designed by the host, independent of Ares. Now, why am I highlighting this, again? Well, after running games at this event for three years, using Zeppelin's and aircraft carriers to draw in players, I didn't know how many participants I would have at a particular game until I arrived at the convention, if I got any registrants signing up before hand. This year, the game host for this War of the World's scenario has had to put on a second game to allow all the people who signed up, in advance!, a slot to play. I'm sort of bummed, but also very pleased. This is bringing all the players I have been cultivating over the years to the table, but it is obviously drawing a lot more new players to the table. I can't complain, if it introduces new players to a great game. At any rate: It does open up some possibilities. I'm sure we've all thought about this, especially after seeing the Great Martian War footage. The thing is, even these slow aircraft move at quite the pace when compared to ground vehicles. How can you fix that? The general consensus on this group seems to be allow the ground vehicles one move at the end of the round. That's kind of boring. In our system, lenght of arrows apart, tripods can move in any of the three phases. If they move in all three, they are running so they have limits in maneuvre choices and they expend energy. Besides, some things like recharge or fire must be done instead of moving. In the original book, a tripod running did so "at the speed of an express train" - call it 100 kmh or higher. I'm curious for this game. Are you shure those Tripods comming from Mars and not out of mad German scientist's lab? 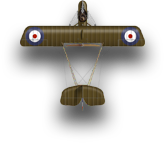 Just in case I want to try out a SPAD XII in the play-testing, I needed a card. I will use the SPAD VII models I have on the table, but I needed the stats, too. Hmmm... Might need one of those new Equipment cards, as well, to cover the rules for using the cannon. Note: In Tripods & Triplanes, the Explosion Card does half-total damage. In this case, the Tripod has a damage resistance of 18, so the Spikey Zero was worth 9 damage. However, with the second damage card also being 9, the Tripod is destroyed. After Action Report will be available, when authorized. A vintage taste for your deep-fried Mars Bar!